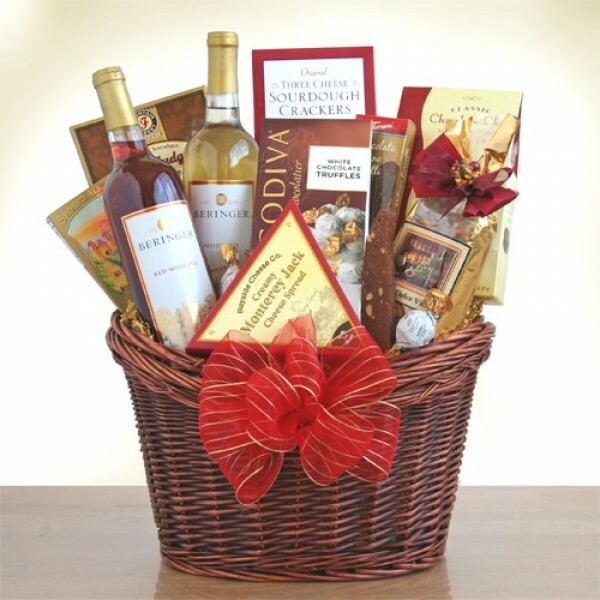 This lovely basket features two bottles of Beringer Moscato wine. Beringer white Moscato with hints of pineapple and Beringer Red Moscato with a blend of zinfandel and berry flavors are sure to be a hit! We have paired them with creamy cheese, sourdough crackers, Dolce Vita snack mix, smoked almonds, classic chocolate chip cookies, chocolate biscotti, a hot fudge brownie and decadent Godiva white chocolate truffles. It's simply Moscato Marvelous!